Findings: Irregular signal (a) in the inferior aspect of the right globe with a small focus of bright signal along the medial aspect (b). Basilar artery (ba). 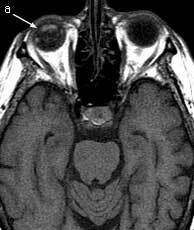 Stalk of the pituitary gland (st). 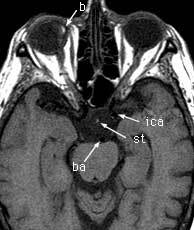 Left internal carotid artery (ica). Cerebral aqueduct (aq). 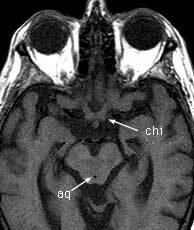 Optic chiasm (chi). Generalized cerebral atrophy.